How Does Your Garden Grow in Fawnskin? 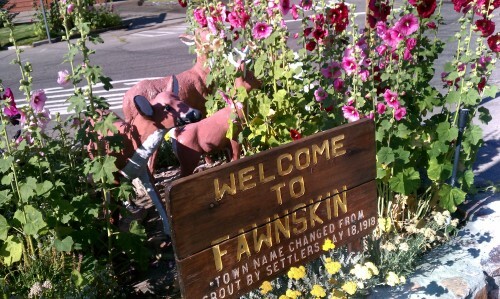 Fawnskin is a beautiful but rustic little place. 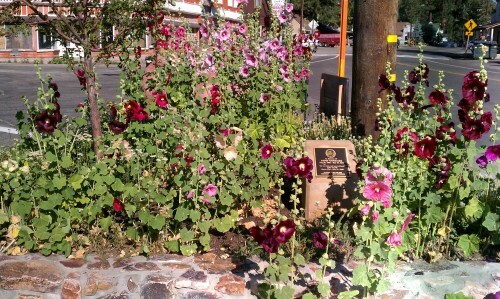 One of the joys of living around these parts tends to be all the beautiful gardening efforts that locals and the NSIA put out toward the local beautification. After June, things tend to ramp up with neighbors diligently working to have a garden. These efforts happen annually despite the critters, unseasonal snow, rocky soil and other challenges. If you walk around town you can enjoy some of the efforts–but if you are not around, GG thought you needed to enjoy them virtually. There are a number of spots to enjoy. Most people are familiar with the Post Office Garde,n or Sister Annette’s memorial garden, but you can also enjoy growth around Miller Park, Dana Point Park or around the Fawnskin triangle. A few neighbors have made good headway. Now GG has pretty much given up, but I do have a garden of sorts. The problem is that it often gets whacked back by a well meaning neighbor. You see, I tend to like the wild look. Plus the plants give me more privacy, but not everyone views wild growth in the same way. Down the road, Linda and Thomas have transformed their little place into a magical, perky home with a garden filled with whimsy. It contains both beautiful plants and edible ones. GG is waiting to see how they thwart some of the critters that might take a liking to their efforts. 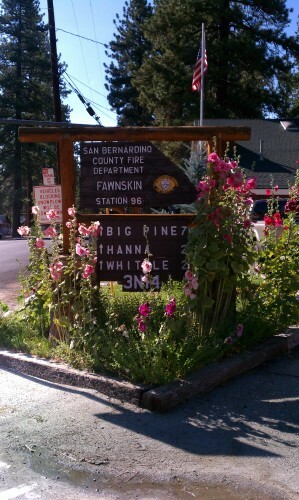 The fire fighters were out recently clearing out weeds and helping beautify the signage around Fire Station 96 as well. Now, if you really want to know why I like to get out and amble, one of the reasons is that I get to see an eyeful just about every excursion. Most of what I spy with my little eye is good. But I have to say that I was a bit confused as to why some non-native, house plant like plantings turned up over in Miller Park. It is a mystery as to who planted them. NSIA has been tending the grounds regularly but these were placed recently. 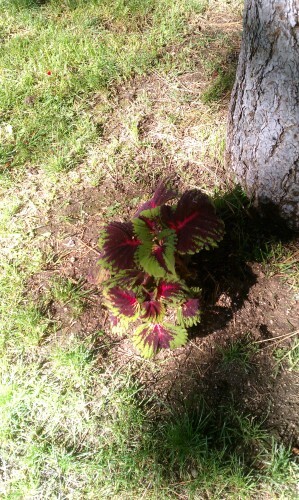 The geranium plant was dug up by some critter but the other one still remains. Now I have to report on one of the fun mysteries of the week–it was the appearance of a matching pillow that showed up at the neighbors. 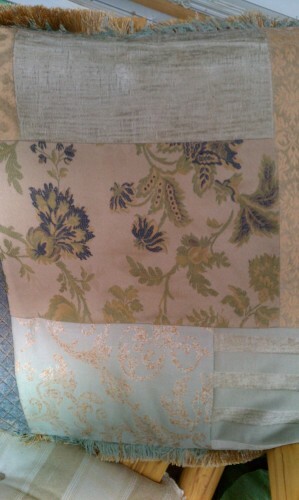 The pillow was an exact match to the other 70s pillows on their porch. An unsigned note was left indicating that it was a “pay it forward” gift. We tend to like good deeds, and although the neighbors suspected GG was at the bottom of this, and called wanting to credit me with the good deed, I had to truthfully decline taking credit for it. But, it was a good excuse to go over and take an “action news photo” to document the event and to catch up with them. Now GG divulged a few stories, and so got teased over the “chicken incident” and other such nonsense. It was all in good fun, and was good for some belly laughs. Nothing is sacred around these parts it seems. Speaking of which, I appreciate the help offered up by a few neighbors. In case you have not heard, GG has relocated temporarily and so is out and about in other parts of Fawnskin. One of the perks is that I am getting to know other neighbors AND I get to spyobserve other activities I might miss otherwise. 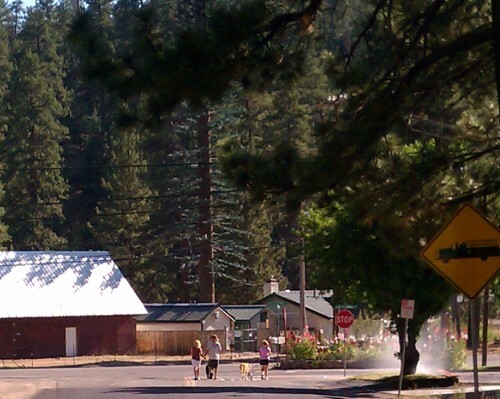 For instance, last night I was out walking and half of Fawnskin…well, a few folks anyway, were out walking their dogs. I like to see neighbors being social with each other and it seemed as if everyone was out with their mutts. And yes, there were more than were in the picture. Steve was out with his dog, Mary was out with her dogs, and Bear Dog was happily marching around with me. Joyce was sitting out on her stoop when I got in with her little dog. In case you were wondering, news around here is scarce. Kathy Portie (of Grizzly fame) is living in Fawnskin now and Post Master Mike is waiting on the new grand baby that is due in early December. Other than that, can’t think of much to report. So, all I can say is, if you see me, be prepared. 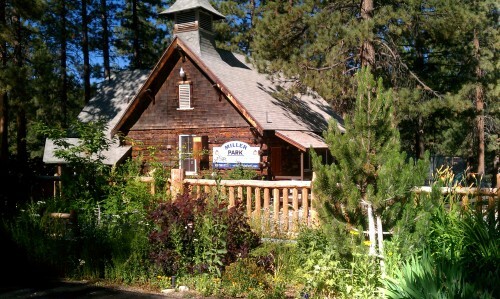 This entry was posted on Tuesday, July 16th, 2013 and is filed under Gardening, High Altitude Living, Small Town Living.